The principal title of the National Wrestling Alliance, this title traces its lineage back to the turn of the 20th Century, descended from the battles of George Hackenschmidt, Frank Gotch, and Ed Strangler Lewis. The lineage was largely unbroken until the 1960's, when Vince McMahon Sr. continued to recognize Buddy Rogers as champion when he had actually lost the title. This created the WWF World Heavyweight Championship. 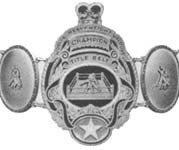 The main branch of the belt (the one recognized by the NWA and its member promotions) continued through the 1990's until Ted Turner bought WCW and pulled out of the NWA. All NWA titiles were stripped and replaced with WCW titles, including the WCW World Heavyweight Championship, WCW World Tag Team Championship, and WCW United States Championship. The NWA later held tournaments in independent promotions to fill these vacancies, although the World Heavyweight championship necessitated two tournaments due to the actions of Eastern Championship Wrestling's Shane Douglas in the first, where he threw down the title and declared himself the World Heavyweight Championship of the newly-renamed (by Tod Gordon) Extreme Championship Wrestling. The NWA titles were defended on small independent shows throughout the United States from the mid 1990's to the early 2000's until Total Nonstop Action was established and purchased the rights to the NWA World Heavyweight Championship, as well as the NWA World Tag Team Championship. At noon on May 13, 2007, the NWA Board of Directors officially stripped Christian Cage of the NWA World Heavyweight Championship and immediately began a tournament (dubbed "Reclaiming the Glory") spanning the entire summer of 2007 to crown a new champion. The tournament was won by Adam Pearce. For a complete history, please visit WrestlingTitles.com. NWA World Heavyweight champions occasionally wrestled in Mexico and defended the championship. On October 25th, 2008 it changed hands for the first time in Mexico when Blue Demon Jr. defeated Adam Pearce to become the first Mexican masked wrestler to win the championship. This page was last edited on 18 February 2016, at 20:23.